Re-Upholstered Hand-Me-Down Chairs - Sew What? Sew Anything! These re-upholstered hand-me-down chairs achieve a casual look that transforms stuffy old chairs into cottage chairs with a casual chic look. Very appropriately named by the client, the cottage chairs contribute to a relaxing vibe for her second home. Cottage home furniture is the perfect invitation to get in touch with your inner vacation self. To set the cottage furniture tone the painted legs in white paint were the inspiration. 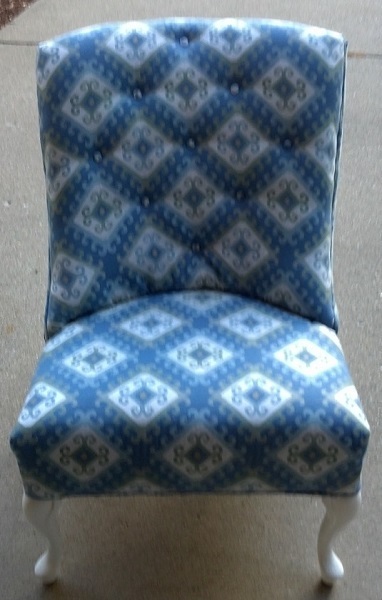 A great fabric and buttons add a flair to this chair and its matching sister. When these chairs were delivered my client talked about how she and her husband, both hard working lawyers, would love to sit and relax in these re-upholstered hand-me-down chairs while watching the wild life from their cottage porch.